Dav Pilkey, creator of Captain Underpants, wrote and illustrated a decidedly pro-vegetarian children’s book for publishing behemoth Scholastic. 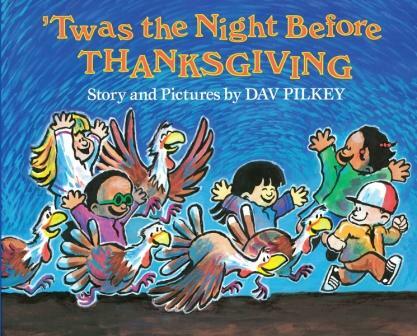 In a playful parody on the classic Christmas poem, Pilkey brings a busload of children to a turkey farm where they befriend birds Ollie, Stanley, Larry, Moe, Wally, Beaver, Shemp, and Groucho. The drama begins when the children question the farmer about an ax they have found, and his answer — that he plans to slaughter their friends — brings them to tears. Happily for the children (and the turkeys), the farmer and teacher rush away to get cups of water to calm the crying children, which gives them time to become “calmer” and “mysteriously fatter.” After they waddle onto their school bus, many with feathers busting out of their jackets, the farmer discovers his turkeys have disappeared! It’s hard to believe that Dav Pilkey was not a vegetarian when he wrote this book, but it’s not surprising to learn he’s now a vegan. Ages 4-8. For activities and lesson plans to accompany the book, click here or here. Thanks for reviewing this book. We bought it for our two year old because she’s been talking a lot about eating chicken nuggets like her friends. This book really help drive home to her what it means when we eat animals. The scene where the children and the turkeys are crying really stops her every time. After reading this book, and talking about how a lot of people eat turkeys for Thanksgiving, she said “I don’t eat turkeys because I love them.” Then she paused to think and said “I don’t eat chicken nuggets because I love chickens.” A true break-through. It just took him a bit longer to see the truth! Yay Dav!